Forty plus years of bird monitoring - the history of the Canna Ringing Team. On the 18th of May 1967 the Torrey Canyon, a huge super tanker carrying 120,000 tons of crude oil from Kuwait, hit the Seven Stones reef between the Cornish mainland and the Scilly Isles. The resulting oil spill killed around 15,000 seabirds and the entire incident generated a huge amount of media coverage. 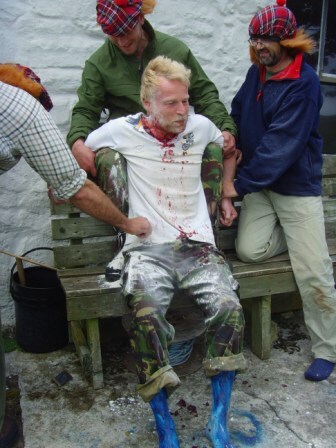 It was this incident that indirectly led to the Canna Ringing Team’s involvement with Canna. As a direct result of the spill huge numbers of oiled seabirds were taken into care to be cleaned and rehabilitated. An appeal for funds to support this work was very successful and was oversubscribed. It was decided that some of the excess money raised should be used to conduct ‘Operation Seafarer’ the first ever nation wide survey to count all the seabirds in Britain and Ireland. This would provide a baseline to assess the impact of other oiling disasters on our seabirds. The survey was to be run in 1968. Early in 1969 Andrew Ramsay, at that time a student at Aberdeen University, contacted the organisers of Operation Seafarer to ask them if there were any Scottish islands still requiring survey work. They offered him the Flannan Islands, the Treshnish Islands or Canna. With a regular ferry service Canna was the obvious choice. 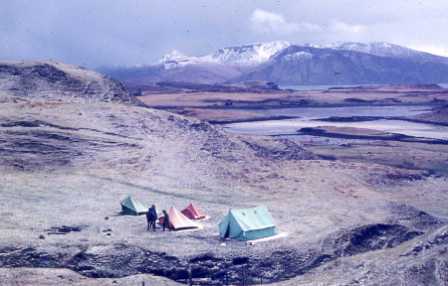 The first trip took place in June 1969 and involved four Aberdeen University students. These were Andrew, Alan Leitch, Alistair Duncan, Pete McDougall and his daughter Rachel, a 2nd year medical student from Cambridge. They were based in tents at the campsite and over a twelve day period they attempted to count the colonies and ringed 795 birds. They also located the Tarbert Road shearwater colony and Andrew, his father and Rachel returned for a weekend that September to ring the fledging chicks. The first trip was so successful that Andrew decided to organise follow up trips in 1970. Finance was secured with grants from Aberdeen University Exploration Society. Three visits were made during 1970 from 23-26 March, 13-28 June and 22-27 August. The March and August visits were targeted at ringing shearwaters. A sample of birds had their underwing dyed yellow in an early attempt to ascertain information on foraging ranges, which unfortunately proved unsuccessful due to a lack of recorded sightings at sea. The June visit meanwhile concentrated on ringing and counting the other seabird species. The initial expeditions were university funded and we were encouraged to seek additional support from unrelated commercial companies. These requests generally resulted in offers of supplies such as McEwans Export from Scottish and Newcastle Breweries Ltd., packets of dried food from General Foods Ltd., pork products including polony from McGrouther Ltd., tins of margarine from Unilever Export Ltd. and meat pastes and tins of lovely chicken supreme from C.S.Shippams Ltd. These contributions were to influence our Canna diets for many years to come! In 1972 I led the trip for the first time and we undertook our first attempt at censusing the shearwater colony, by counting the number of burrows with faeces at the entrance. The 1973 trip involved some new university participants included Philip Round, John Parrot and Stephen Baillie. During the main summer trip we were able, for the first time, to use the goat tracks to access the North Cliffs from above Sloc a’ Ghallubhaich and this allowed us to cover all the sections to the east almost up to the cave. We were still using the university’s tents and were based at the campsite. Hector and Jenny MacKinnon, now in the recently built Caslum, were very kind to us offering baking, home brew and even shelter when the weather was very bad. By 1974 the main participants had all left university so grants were secured instead from the Seabird Group and the Scottish Ornithologists Club. It also saw the number of visits per year increase to four with the start of the May visits, when Andrew took out a party of pupils from Fort William High School, where he was now a geography teacher. On the bird front a new development was the opening up of a sample of Manx Shearwater burrows, so that we could start to monitor breeding success. Ian MacKinnon also explained how we could access the Shag colony at Lamasgor, so we could now enter virtually all the seabird colonies on the island for counting and ringing. Alan Leitch’s wife to be – Em accompanied us that summer along with Katy Todrick. The 1975 trips followed the same pattern as the previous year. John White, a colleague and flat mate of Andrew’s came out with us on the early April trip. John had managed to source a barrel of beer, which was piped off the MV Loch Arkaig, by Alan Leitch, followed by John playing his trombone! 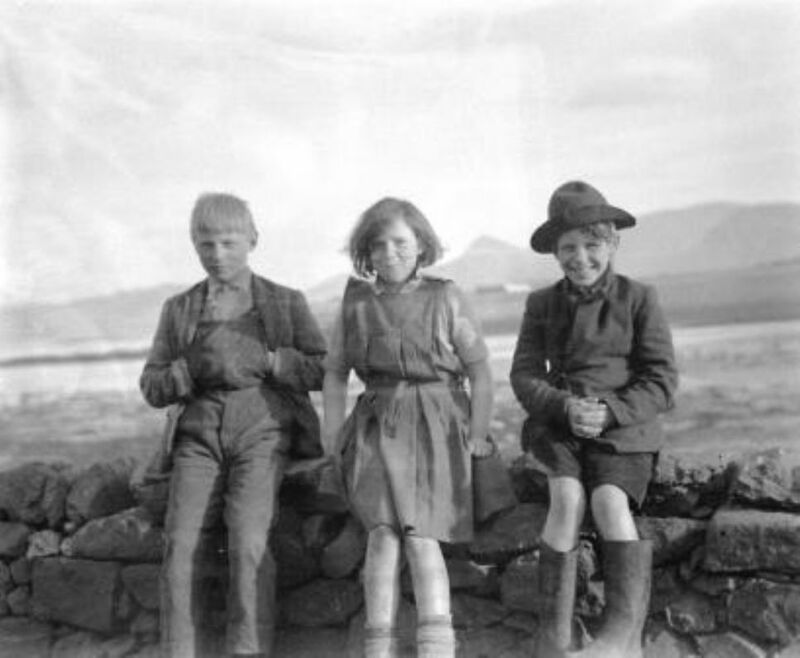 We were staying at Jane’s cottage that year and we were able to reciprocate the island’s hospitality as a centre for ceilidhs and general merriment, with Ian, Charlie and a very young Packy regularly stopping by. 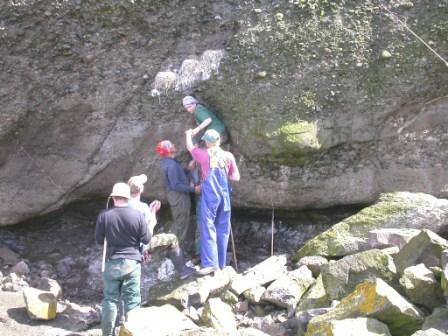 During the summer trip we persuaded Angus, for the first time, to land a few of us in at the cave, so that we could ring a large sample of guillemot chicks. Four of us ringed two hundred and eighteen chicks in one hour. 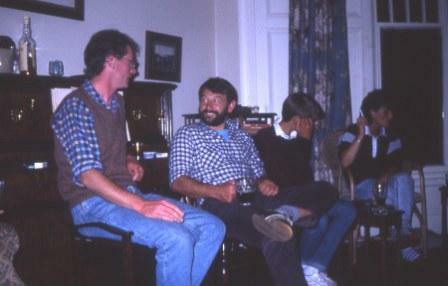 1976 saw yet another major development in the Canna Ringing Team story. Andrew had moved from Fort William to Orkney to teach and I was now a geography teacher at Glenurquhart Senior Secondary School (as it was then known) at Drumnadrochit, where I had established a school bird club and had enrolled a pile of keen pupils. After a visit to Canna in April with Hugh Maclean and his two boys, I persuaded the school rector to allow us to take a group over in late May. Amongst the school pupils, that we squeezed into Jane’s cottage was David Aiton making his first trip. The weather for much of the trip was terrible. It rained all the way to Garrisdale Point, where we found a cave we could shelter in and light a fire. Magically the rain stopped, we went through the shag colony catching lots of adults and the kids loved it. From then on the May trip to Canna was to prove the highlight of the year for many of them. 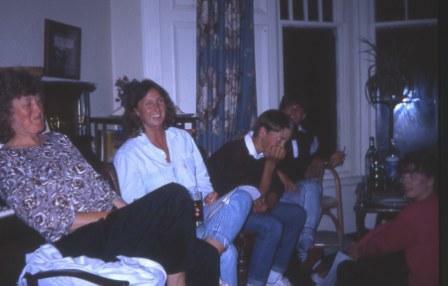 New participants on the summer trip that year included Skitts and Linda Rae, John and Lorna Hardey and Gus Jones. In the late summer I returned to continue the monitoring work accompanied by my wife to be Dora and a very young Tina, their first visits to the island. By now we had got very friendly with Dan MacKinnon, who was popping into see us on a regular basis to get the craic. 1976 also saw the publication of our first, of many papers based on the Canna studies, an article in the Seabird Group Journal on the movement of Scottish Manx Shearwaters. In 1977 we were joined for one visit by Colin Corse, who was so impressed with the island he subsequently named his house in Kirkwall – Garrisdale. We had now established a programme for counting and ringing Corncrakes. We caught the adults at night during the May school trips and ringed the chicks as the hay fields were being cut. Angus, who undertook the mowing, became involved and he was soon ringing more corncrakes than anyone else in the UK! In return we often helped to gather and stack the hay. This was the first year that we marked study nests in the Shag colonies at Garrisdale to determine breeding productivity and we initiated assessing gull productivity by counting the number of successful and failed nests in several study colonies. In 1978 both Andrew and I were members of the Highland Ringing Group, a group of keen birders/ringers in the Moray Firth area. Here we met Ronnie Graham and encouraged him to come out to Canna. We also decided that older Glenurquhart bird club boys who had just left school could come out on the summer trip and Kenny Mackinnon and Ian Cameron came out that year. Later that summer Detty and Hugh Maclean, plus sons Neil and Colin and their cousin Dola joined Dora, Tina and myself on the final trip of the year. Joining us on the April trip in 1979 was Keith Brockie and one of his sketches from that trip showing White-tailed Eagles on the north side appeared in his first published Wildlife Sketchbook. Ronnie Graham returned in the summer and brought his wife Shenac along with sons Kenny and Alan. They camped whilst the rest of us, including Hugh Maclean, stayed in Mary Anne’s green caravan behind Doirlinn. Bird club boys that year on the summer trip were Ian Cameron, David Aiton and Dugald Ross. We were a regular fixture on the island’s ceilidh circuit and one particularly memorable night involved Ian consenting to get his ears pierced by Caroline MacIntyre, using a needle and a tattie, followed by Alan Leitch piping us through an eightsome reel in the early hours. 1979 was one of the wettest summers we had experienced and the west end trip involved setting yet another fire in the cave near Garrisdale Point to try and dry out. Glasgow University sent out two students to accompany us that year to colour ring gull chicks. Unfortunately a combination of vertigo, the inclement weather and a very poor breeding season meant that they only managed to mark a small sample of chicks. By 1980 we were ringing just over 3000 birds a year, building up histories of individual birds, annually censusing the entire island’s seabird population and gathering information on the other birds of conservation interest. We had also started colour ringing Herring Gulls and Guillemots as a five year project to try and ascertain dispersal and site fidelity. A new addition to the team came out in the final trip of the season, my son Robert aged five months, screaming like a banshee, according to his mother! 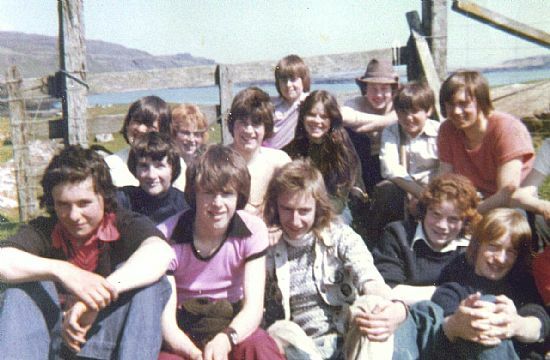 In 1981 Doug Forrest helped out with the May school trip and we recorded our first accident when Robbie Paterson slipped and fell whilst monitoring the Manx Shearwaters above the Tarbert Road. Ian MacKinnon diagnosed the injury – a broken wrist- and we arranged an ambulance to meet the ferry in Mallaig and take him to the Belford Hospital in Fort William. For the main summer trip another Highland RG member joined the team ‘gentleman’ John Carruthers. Ronnie, returned with the family again, having missed a year. Shenac and the boys camped, whilst we once again stayed in the green caravan. We also began to co-operate with Dr. Mike Harris of the Institute of Terrestrial Ecology (Banchory) and began collecting food samples from Guillemots and Shags as well as weighing and measuring a sample of adults and chicks. This was the final year that Alan and Em Leitch came out on the Canna trips. In 1982 for the summer trip we got the use of Tighard. Doug Forrest came out again that summer and so did Hugh and Detty along with son Colin and his pal Rowan Sheppard, who eventually went on to play rugby for Scotland at international level. 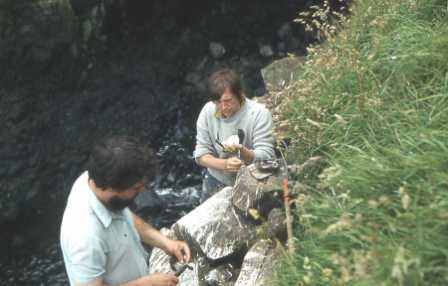 1983 saw Kenny Graham, now able to close a G-ring, get his first taste of real seabird ringing. Angus had taken some of us round to do the cave and the count. The plan was for him to drop us off at Buidhe Sgor where we would meet up with Davey, who was looking after Kenny. Angus, unfortunately, dropped us off on a small stack and we had to wait there quite a while before the tide dropped so we could get off it and meet up with the other two. At the end of that summer Angus and Rosemary left the island with their two girls, Celia and Amy, for a new life in New Zealand. They went off on the same boat as myself, Dora, Hugh and Detty. It was a very poignant moment as the boat left Canna and a haar came in suddenly blocking the island from view. We were really going to miss Angus and Rosemary as they had always been very good to us and were always a destination each visit for a party night. From then on Packy took over Angus’s role on the island, including ringing Corncrake chicks and taking us round the north side. Winnie was also by now dealing with our bookings and generally looking after us. 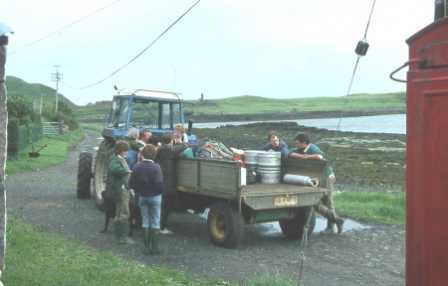 By 1986 our work on Canna was providing high quality long-term data and further collaboration with Dr Mike Harris resulted in him obtaining funding from the Nature Conservancy Council for our work on Canna. That summer ‘Sam’ Samuels, who was living with his family at Burnside took some of us out to Heisgeir in his sailing boat. It was a fantastic trip and amongst the highlights were a group of three Killer Whales just off the jetty. Robin Wilkie had arrived on the island and along with Ian and Dan was assisting us with transport and joining in the evening entertainment. Highlight of this would be a visit to the Change House, which would involve a ceilidh topped off with a large plate of Nora’s wonderful scones. In March 1987 Mary Anne Maclean died. Several of us went over on the Western Isles to attend the funeral. After Jessie MacKinnon had died in 1978 Mary Anne moved out of Doirlinn and into the Square. She was a great character and enjoyed company so no trip to Canna was complete without a visit to her or from her. We would then get regaled with her stories mostly in English, but with the occasional smattering of gaelic, all finished with a hearty laugh. She had a great way with words and was always entertaining company. She was also very kind and would often arrive with a pillowcase full of fresh scones. After a major operation (of which she was very proud) she left the island and moved into a care home in Fort William. Enroute to Canna on a Friday evening we would pop in to see her and she was always keen to see us, especially if we had the usual present – a half bottle of something medicinal! The summer 1988 trip had two new ‘bird club boys’ – Philip Brown and John Macdonnell. Kenny was also now a full member, of the team, though still relegated to the tent whilst the rest of us were billeted in Kate’s. This year saw his first attempt at fleyging Guillemots at the cave, which ended up with him going for a dip in the sea and losing his pliers, much to Phillips amusement. Whilst in the Cave the weather conditions deteriorated rapidly and Packy had to call up the services of one of his friends with a big crab boat to retrieve us from the rocks. Following the death of her mother I brought Dora out to Canna during the main birding week. Winnie organised a surprise 40th birthday party and cake for her up at Kate’s. It was a great night thoroughly enjoyed by everyone. Kate’s Cottage was now well established as our base and we were still running four visits a year, though the April visit had been replaced by a long weekend in early May. We provided a lot of utensils, plates, mugs etc for Kate’s and Winnie supplied replacement furniture as chairs in particular did not appear to last long. As a group we were always willing to assist with maintenance and improvements as and when we could and we are delighted with the improvements The National Trust has made over the years. The final summer visit still involved myself, Dora and Robert (often with a friend) and Hugh and Detty. Although I finished of the bird monitoring work that week it was less intense and there was time for more visiting and socialising. This would include a visit down to see Effie Gillies and her family on holiday on Sanday and they in turn would come up to Kate’s and the kids would do their party pieces and be rewarded with goodies. During this trip Hugh would often be asked to assist with repair and maintenance work, particularly with welding. He had trained Packy to weld and had provided or organised welding equipment for the island. 1989 was a special year as it marked our 21st year of seabird studies on Canna. 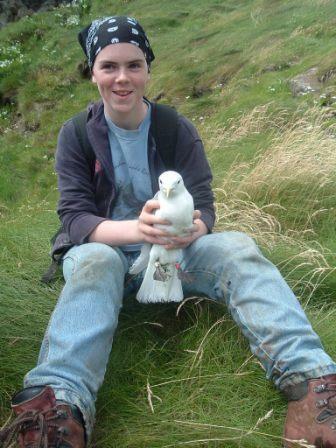 It was also the final year of the Glenurquhart High School bird club trips. I had run these for 15 years taking a large number of school pupils, many of who returned year after year. I was accompanied on all bar one trip by Hugh Maclean. Hugh had a great rapport with the kids and acted as our head chef. To come on these trips he had to take time off work, often unpaid. It was a fantastic commitment to which we were all grateful. David Aiton, Robbie Patterson and Donald (Vikker) Fraser also returned after leaving school to help with these trips. We were also very grateful to the crew of the ferry who would allow us to sleep the Friday night on the boat, prior to the early Saturday morning sailing from Mallaig. The kids would be ordered to be on their best behaviour and not make a noise in case they woke up the crew although it was usually the other way round in the wee small hours. On the seabird monitoring side our work received a boost when we became a key monitoring site for the Nature Conservancy’s Seabird Monitoring Programme. This put our finances on a more secure footing, but also meant we were required to establish plots to monitor the breeding success of Fulmars, Kittiwakes and Herring Gulls, as well as continuing our work with Shearwaters, Shags and Guillemots. In addition, Glasgow University Zoology department also asked us to collect food samples from Herring Gulls for a five year project. Following the main birding week the National Trust for Scotland very kindly provided Tighard for us so that we could hold a 21st celebration, joined by families and partners. Ronnie started proceedings by giving an amusing illustrated talk of our Canna adventures. All the islanders, Magda’s nieces and various workers joined the Canna Ringing Team. Margaret Campbell was guest of honour, though unfortunately John Lorne was not well and could not attend. A large buffet meal was produced, organised by Shenac, Dora and Andrew’s wife Linda. After this we enjoyed a lively ceilidh till the early hours with songs in four languages (English, Gaelic, Basque and Spanish) and dancing – the highlights being a conga through Tighard and a strip the willow, Orkney style, on the lawn outside, piped by Alan Graham, by now a full team member. 1990 saw yet another major change. I had moved to Tain Royal Academy (where Andrew was an assistant head teacher) to be principal teacher of geography. Here I met Andy Wright who was running a school environmental group. I had also started up a bird club so, aided by Catriona Maclean, we ran a joint school trip out to Canna in late May. Amongst the pupils on that trip was Simon Foster. In the late summer trip that year we were all drafted in to help Robin and Winnie with their new house on Sanday. I was up on the roof with the squad nailing the sarking on, whilst Hugh was down below, cutting and passing the sheets up to us. Charlie and Ian MacKinnon were in charge and by the end of the week we had the house wind and watertight. Through the early 1990s we were still running four trips a year and had a fairly steady team with TRA school trips covering the late May trip, Highland Ringing Group folk the main summer trip and myself with Dora, Hugh and Detty, Robert and Martin Douglas the late summer trip. We were all shocked when Ian MacKinnon died in 1992. Myself, Hugh, Ronnie, John and Davie went over on the “Shearwater” for the funeral. Ian’s friendship and assistance had underpinned our Canna trips from the very beginning. 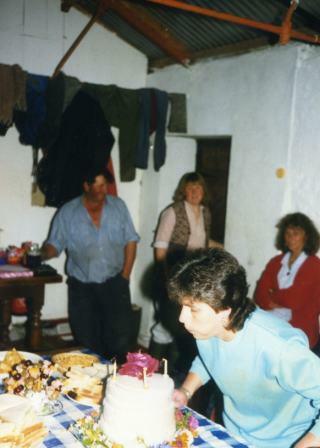 Our trip, that year, in early July coincided with Mairead’s christening. We were all invited to the chapel for the ceremony and then that evening Alan piped us over to Sanday for the official house warming party for Robin and Winnie’s new house. The party lasted into the early hours of the morning, when there was a slow staggered return of revellers back to Canna, including one of Ferg’s workers who managed to lose his teeth in the process. They have never been found to this day! In autumn 1993 Packy and Wendy got married and the CRT and partners + Hugh and Detty were invited to the wedding reception at the Drumossie Hotel, Inverness. The exception was Kenny who that summer had worked with Dan as a general farm worker, as a result he had volunteered to remain on Canna and help mind the farm. All the guys were in kilts and the ladies in dresses. It made a change for once to see everyone in smart clothes! It was an excellent night with much talking, dancing and draming. 1993 had been John Carruther’s final trip to Canna and in 1994 he was replaced with my son Robert, Simon Foster and Frankie Buchler who all came out on the main summer trip. John was a bit of a character. On one glorious day as we walked round the west end he decided he would go in for a swim at every beach. He had brought his trunks with him, but forgot his hat. Ever resourceful he placed his underpants on his head to keep the sun at bay. 1994 also marked the end of the April/early May trip partly due to the decline in shearwater numbers. Kenny worked on the farm that summer and like the previous year, joined us in Kate’s for the summer bird work. 1995 was our best ever ringing year with 4061 new birds being marked and a further 1536 retrapped giving a grand total of 5597 birds caught. It was Shenac’s last summer. She had always camped (originally with the boys) whilst we stayed in Kate’s and had kept an eye on us, making sure at least the soup was on for our return. Following the early years of dried food, smash, liver and corn beef hash, the catering had improved quite dramatically. Now thanks to Nora allowing us to use the freezers at the Change House, most folk cooked a meal, which they brought out with them and froze till it was required. Haggis always featured, piped in by Alan and the toast given by Ronnie. 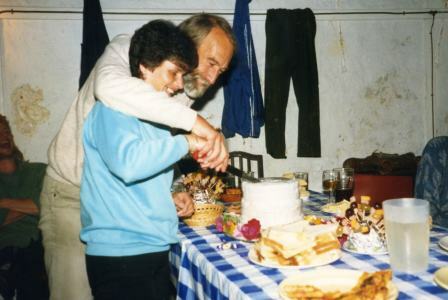 Visits to the Square to see Wendy and Packy and to Sanday to see Winnie usually resulted in good nights ceilidhing into the early hours of the morning. With song sheets distributed we would go through our repertoire of traditional Scottish songs, popular songs and rugby songs, several of which required individual participation, sometimes on top of a bit of furniture. Dan died in May 1998 and his funeral was held whilst we had a school party on the island. Several members of the CRT attended and Kenny was honoured by being asked to share a cord with Neil MacKinnon as Dan was laid to rest. Dan was a great character, well read and a good singer. He enjoyed the craic when we were over and he was always good company. When we were going to the west end he would take us to Tarbert in the tractor and trailer and then later come back to meet us. On the return journey we would be treated to an unscheduled stop next to one of the springs where he would produce a few cool cans much appreciated by everyone. He would then come up to Kate’s for a dram and the craic. In return Kenny, Davey and Alan would often help him out with gathering and clipping. He was also very good with the school kids, seeking out the ones with a farming background and quizzing them about this and that. He would always remember them and would like to get feedback in later years about how they were getting along. In summer 1998 Ally Young joined the team, when we were finally reassured that he wasn’t scared of heights – a piece of misinformation that somehow stuck. Simon managed to badly sprain his ankle just walking out of Kate’s en-route to Winnie’s with a rucksack full of supplies. Luckily the supplies were undamaged. He was attended by a doctor staying at Tighard, who insisted on treating him outside due to the pungent aroma in Kate’s from the team’s clothing! 1998 was also the year that Canna was designated by SNH as a Special Protection Area for its internationally important colonies of breeding seabirds, based on data supplied by the CRT. Robert’s last summer visit was in 1999 and Frankie Buchler’s in 2000, when he slid down the rope at Buidhe Sgor scarring his hand in the process. Through the 2000s the team was augmented by guest appearances from James Cameron, Sean Morris, Chris Rodgers, Mike Werndly and Shona Quinn. Kathryn, Wendy and Packy’s eldest daughter, began to accompany us into the colonies during the main summer trip, probably the first islander in three generations to visit some of these sites on the north side. She could also squeeze into small holes to get birds no one else could reach! Gerry Mackinnon and Murdo Jack were now running the farm and Murdo would normally be available to help move our vast amount of gear between the pier and Kate’s. 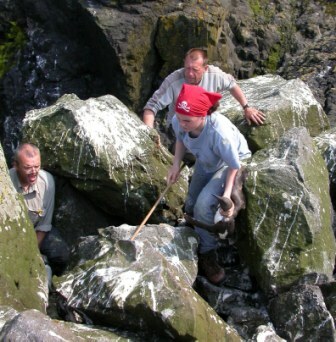 2001 was the first year we used a large fleyg net to catch auks on the north side. Operated mainly by Kenny and Simon it has greatly increased the number of adult razorbills and puffins caught, providing more information on the age of return of young birds to Canna. Ronnie decided that 2003 would be his final summer trip, handing over the honour of toasting the haggis to Ally. Perhaps it was the visit that year into the cave that influenced his decision. Strong winds had delayed our attempt, but eventually Packy said he’d give it a go. We got round to find in Packy’s words “a very jubbly sea”. The dinghy was launched and heaving about in the sea we managed to transfer in pairs from the boat to the sheltered inlet where we could land. We got everyone ashore, bar Andrew. We agreed with Packy that if the sea got worse we would just walk out around midnight at low tide. Having completed the ringing we sat on the rocks waiting to see what would happen. A cheer went up as the Heather Belle was spotted coming round the stack towards us. Davie started to transfer folk and sodden gear back to the boat in a semi-deflated dinghy. The actual transfer required the skill of a gymnast as the Heather Belle rolled towards the dinghy you had to grab the rail and vault over. Eventually we got everyone safely aboard and returned to find that Andrew ‘sick with worry’ had vanished with a bottle to the square and had failed to get the soup on for us! Simon and Kenny had increasing concerns about the safety of the ever increasing amount of data getting ferried back and fore to the island and contained in four large ring binders. They decided it was time for a more secure electronic version and arranged funding from SNH in 2003 that allowed us to pay Joanne Morrison and Morven Munro, co-incidentally an ex Glenurquhart pupil, to get our entire backlog of 100,000+ bird records computerised. This was a great step forward and has hugely assisted with handling and analysis of the data we gather and the production of scientific papers including the recent paper on Guillemot survival co-authored with Prof. Mike Harris. Since the 1990s we had noticed some worrying declines in seabird numbers. Most noticeably in the Manx Shearwater colony along the Tarbert Road, where in the mid 1970’s we counted 1500 occupied burrows but by 1999 could find none. We lobbied Abbie Patterson, the NTS species recovery officer about this and during winters 1999 to 2001 he instigated mammal surveys on the island over the winter period to assess the numbers and distribution of rats and mice. In 2003 Abbie produced a report to NTS, which led to Richard Luxmoore (NTS Head of Nature Conservation) setting up working group to look at the possibility of a rat eradication project and to secure EU LIFE nature funding. 2005 marked the end of an era, being the last school trip. I had run them for 15 years with Glenurquhart High School, then another 15 years with Tain Royal Academy. Andy and Betty Wright accompanied me on most of the TRA trips and the final one was organised by their daughter Anna. As I had retired from teaching in December 2004 I went along as a helper. The pupils who went on these trips by and large really enjoyed them. When I meet former pupils they often mention the Canna trips as highlights of their school career. It is a shame that in the current H&S environment such trips are virtually impossible to run these days. 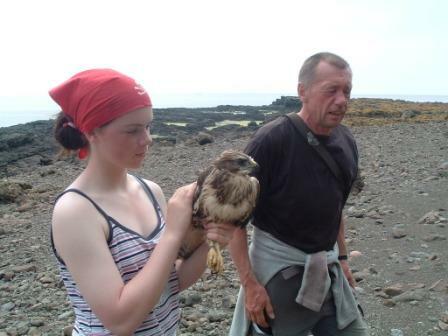 The NTS bid for EU LIFE Nature funding proved successful so in June 2005 I was taken on as project manager for the Canna Seabird Recovery Programme. At the same time a contract was drawn up with Wildlife Management International Ltd. a New Zealand company specialising in eradication projects. I will never forget our first day on the summer trip in 2005. As usual we went over to the north side. As we made our way down the cliffs, we could sense something was different – there was no noise. When we got to the first auk and kittiwake colonies they were virtually empty. We had never seen anything like this before. Following the bumper season in summer 2004 there had been a massive wreck of young and adult auks in Northwest Scotland in late summer. For some reason the food supply had disappeared. Unknown thousands of birds died and it was obvious that even the following summer food was still very scarce. This was to have an even more devastating affect on Canna’s seabirds than the rats. Seabird numbers and breeding success were to remain very low for the next four years. The rat eradication project was, however, underway. 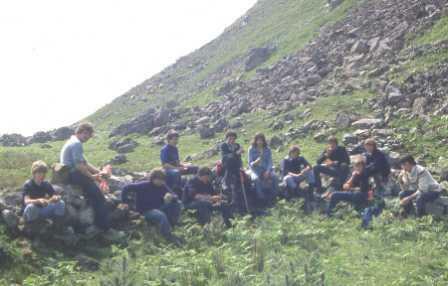 At the end of August 2005 I took Biz Bell and the advanced party of WMIL staff out to Canna. We had been given the New House and Tighard as a base. Eight WMIL staff were joined by a variety of volunteer workers to lay out the bait grid, conduct the poisoning campaign and start the monitoring work. By the end of October 2005 the grid of over 4000 bait stations had been laid out. At the same time an insurance population of woodmice was captured and removed from the island by staff from Royal Zoological Society of Edinburgh. Poisoning began on 1 November and continued till 6 March 2006, when the last known rat was killed. An intense monitoring phase then began to ensure all the rats had infact been poisoned. A reduced WMIL team returned over the winter of 2006/07 to continue the monitoring work and then for a final visit in March 2008, when the island was officially declared rat free. Biz Bell was a fantastic organiser and leader. She got on well with islanders, volunteers and visitors and got the best out of everyone. The successful eradication was a tribute to all those involved, often working in atrocious conditions, and in potentially dangerous areas. From 2006 the May trip continued usually over a long weekend with myself, Ronnie Graham and Martin Carty being the main participants. A new recruit to the summer team was Andrew Call who joined the team that year. It was a spectacular debut, especially in ‘section 0’ on the north side, when a massive boulder he was holding onto came away. He used all his mountaineering skills to outrun it down the scree slope veering out of its path at the last moment, suffering only a massive bruise on his back. The decline in seabird numbers meant we now often had a bit more spare time. This was utilised for some community service such as collecting firewood, cutting and chopping logs, tree surgery, fixing locks, helping with clipping etc. In 2008 Robert and Lianne, along with Anna, Sinead and 7month old Freya accompanied us out for the late summer trip, along with Hugh and Detty. As usual Charlie and Anne MacKinnon were on the island at the same time and as is now traditional several good nights were had, particularly at the Square, at Winnie’s and at the New House, where we were staying that on that occasion. We were very saddened by the departure of Packy from Canna in late summer 2008 and Wendy and family in 2009. We had been great friends with them all over a long period of time. We were even more devastated by Packy’s death in May 2010 and the entire Canna Ringing team, plus families/partners attended the packed funeral service in Mallaig. After Packy’s departure John Clare assisted in taking us round the north side and into the cave, till he left the island in 2011. Andrew Call’s son Fionnlagh joined the team in 2010. That summer also featured Davies stag do on the island. Covered in blue dye and red sauce he was piped round the Sanday residences, supported by the CRT wearing ‘hey Jimmy’ wigs too much hilarity. Andrew Ramsay a regular since he initiated the first trip in 1969, was finding accessing the colonies more and more difficult so was taking less involvement in the trips just turning up for a few days in 2011 and 2012. Otherwise the team remains much as it was since 2001. The social side of Canna visits was always greatly enjoyed. This has led to most of the Canna team bringing their partners and families out to the island at some stage or another. Andrew Call actually visited Canna in the 1980s and brought out his family in the late 90s well before he got involved with the CRT. Kenny, Alan and Simon have all brought their respective wives out and Kenny has returned many times with family and friends. Ally and family come out to the island most years and Davie brought Helen out in 2006 and 2007. These visits are usually for relaxation and socialising with just a bit of birding. On one occasion a cannon net was taken over by Simon and Kenny and with Kathryn’s help they took a small catch of Curlew. On the bird front since 2009 there has, thankfully, been an improvement in the breeding success of Canna’s important seabird populations. As food supplies have returned the birds appear to have stabilised at a lower, but perhaps more sustainable, level. The removal of rats has ensured safe breeding sites and even the Manx Shearwaters are making a slight, albeit very slow, recovery. At the time of writing, forty four years have passed since that first trip and apparently we are now part of Canna’s history, as witnessed by this contribution to the Canna local history group website, set up by Stewart Connor. Since his arrival on Canna, as property manager, Stewart has been very supportive of both the seabird work and additional voluntary work that we do on the island. We are grateful to him and his HQ colleague Richard Luxmoore for supporting our studies and to all the islanders, many of whom are also NTS employees, for making our visits both particularly enjoyable and productive. It is no coincidence that this is the longest continuous running seabird study in Europe and we hope that we will continue with the mutually beneficial relationships established well into the future.